The electroencephalogram (EEG) is the depiction of the electrical activity occurring at the surface of the brain. This activity appears on the screen of the EEG machine as waveforms of varying frequency and amplitude measured in voltage (specifically microvoltages). Examples of alpha, beta, theta, and delta electroencephalography frequencies. Information about waveform frequency and shape is combined with the age of the patient, state of alertness or sleep, and location on the scalp to determine significance. Frequency (Hertz, Hz) is a key characteristic used to define normal or abnormal EEG rhythms. Some waves are recognized by their shape, scalp location or distribution, and symmetry. Certain patterns are normal at specific ages or states of alertness and sleep. The morphology of a wave may resemble specific shapes, such as vertex (V) waves seen over the vertex of the scalp in stage 2 sleep or triphasic waves that occur in the setting of various encephalopathies. Alpha waves generally are seen in all age groups but are most common in adults. They occur rhythmically on both sides of the head but are often slightly higher in amplitude on the nondominant side, especially in right-handed individuals. A normal alpha variant is noted when a harmonic of alpha frequency occurs in the posterior head regions. They tend to be present posteriorly more than anteriorly and are especially prominent with closed eyes and with relaxation. Alpha activity disappears normally with attention (eg, mental arithmetic, stress, opening eyes). In most instances, it is regarded as a normal waveform. An abnormal exception is alpha coma, most often caused by hypoxic-ischemic encephalopathy of destructive processes in the pons (eg, intracerebral hemorrhage). In alpha coma, alpha waves are distributed uniformly both anteriorly and posteriorly in patients who are unresponsive to stimuli. Beta waves are observed in all age groups. They tend to be small in amplitude and usually are symmetric and more evident anteriorly. Drugs, such as barbiturates and benzodiazepines, augment beta waves. Theta waves normally are seen in sleep at any age. In awake adults, these waves are abnormal if they occur in excess. Theta and delta waves are known collectively as slow waves. These slow waves have a frequency of 3 Hz or less. They normally are seen in deep sleep in adults as well as in infants and children. Delta waves are abnormal in the awake adult. Often, they have the largest amplitude of all waves. Delta waves can be focal (local pathology) or diffuse (generalized dysfunction). This section identifies some normal waveforms, including K complex, V waves, lambda waves, positive occipital sharp transients of sleep (POSTS), spindles, mu rhythm, spikes, sharp waves, and certain delta waves (polyphasic and monophasic shapes). These waves are recognized by their shape and form and secondarily by their frequency. They include waves that may be normal in some settings and abnormal in others (eg, spikes, sharp waves). Example of a K complex. 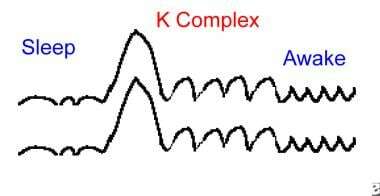 K complex waves are large-amplitude delta frequency waves, sometimes with a sharp apex. They can occur throughout the brain and usually are higher in amplitude and more prominent in the bifrontal regions. Usually symmetric, they occur each time the patient is aroused partially from sleep. Semiarousal often follows brief noises; with longer sounds, repeated K complexes can occur. K complexes sometimes are followed by runs of generalized rhythmic theta waves; the whole complex is termed an arousal burst. V waves are sharp waves that occur during sleep. They are largest and most evident at the vertex bilaterally and usually symmetrically. They show phase reversal at the vertex. V waves tend to occur especially during stage 2 sleep and may be multiple. Often, they occur after sleep disturbances (eg, brief sounds) and, like K complexes, may occur during brief semiarousals. V waves are easy to recognize. 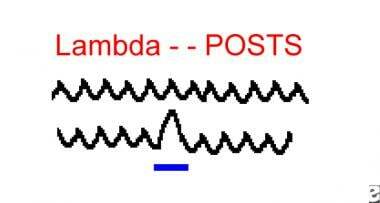 Example of either lambda or positive occipital sharp transients of sleep (POSTS). Lambda waves occur in the occipital regions bilaterally as positive (upgoing) waves. They are triangular in shape and generally symmetric. They occur in the awake patient and are said to be most evident when the subject stares at a blank, uniform surface. Lambda waves occur when reading and occasionally when watching TV. Morphologically, they are similar to POSTS both in form and in occipital distribution. POSTS are triangular waves that occur in the bilateral occipital regions as positive (upgoing) waves. They can be multiple and usually are symmetric. POSTS occur in sleeping patients and are said to be most evident in stage 2 of sleep, although they are not uncommon in stage 1. POSTS are similar if not identical to lambda waves both morphologically and in the occipital distribution. Spindles are groups of waves that occur during many sleep stages but especially in stage 2. They have frequencies in the upper levels of alpha or lower levels of beta. Lasting for a second or less, they increase in amplitude initially and then decrease slowly. The waveform resembles a spindle. They usually are symmetric and are most obvious in the parasagittal regions. 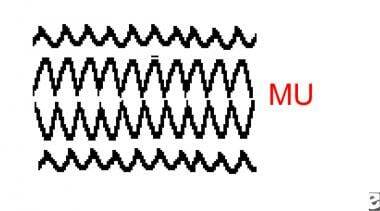 Mu waves are runs of rhythmic activity that have a specific shape. They are rounded in one direction with a sharp side in the other direction. Frequency is one half of the fast (beta) activity. Mu waves disappear with motor acts of the contralateral hand or arm. Unlike alpha activity, they are not blocked by eye opening. Mu waves are seen best when the cortex is exposed or if bone defects (eg, postsurgical) are present in the skull. They tend to be more evident over the motor cortex and in the parasagittal regions. These are recognized by their height, their sharp top, and their narrow base. Spikes and sharp waves usually are abnormal. V waves of sleep in the parasagittal regions in stage 2 sleep can be normal. Small, sharp spikes of sleep or benign epileptiform transients of sleep (BETS) are nonpathologic. They occur in the temporal regions, often switching from side to side. They do not have slow-following waves as do most of the pathologic spikes of epilepsy. Numerous artifacts resemble spikes, but they are distinguished by other waves that may be present, by observation of the patient while they are occurring, and by experience. POSTS can have a sharp contour yet be quite normal. They occur in the occipital regions bilaterally during sleep. 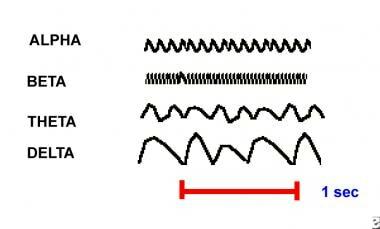 Example of small sharp spikes, also known as benign epileptiform transients of sleep (BETS). These sharp, usually small waves occur on one or both sides (usually asynchronously), especially in the temporal and frontal regions. BETS are rare in children but are more frequent in adults and elderly persons. Although they can occur in epileptic patients, BETS often are seen in individuals without epilepsy and can be regarded as a probable normal variant. For patient education resources, see the Procedures Center, as well as Electroencephalography (EEG). How are normal EEG waveforms defined? How are the frequencies of EEG waveforms categorized? How are EEG alpha waves characterized? How are EEG beta waves characterized? How are EEG theta waves characterized? How are EEG delta waves characterized? What is the morphology of normal EEG waveforms? What is the morphology of EEG K complex waves? What is the morphology of EEG V waves? What is the morphology of EEG lambda waves? What is the morphology of EEG positive occipital sharp transients of sleep (POSTS)? What is the morphology of EEG sleep spindles? What is the morphology of EEG mu waves? What is the morphology of spikes and sharp EEG waves? What is the morphology of EEG benign epileptic transients of sleep? Fisch B, Spehlmann R. Fisch and Spehlmann's EEG Primer. 3rd ed. Amsterdam: Elsevier; 1999. Niedermeyer E, Lopes da Silva F. Electroencephalography: Basic Principles, Clinical Applications, and Related Fields. 5th ed. Baltimore: Williams & Wilkins; 1993. Stern JM, Engel J. An Atlas of EEG Patterns. Philadelphia: Lippincott Williams & Wilkins; 2004.